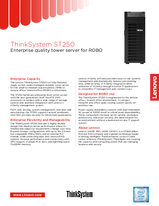 The Lenovo ThinkSystem ST250 is a fully-featured, single-socket, easily-managed rackable tower server for the small-to-medium-sized business (SMB) or remote office/ branch office (ROBO) environment. The ST250 harnesses enterprise-level server power with the next-generation Intel® Xeon® E-2100 processors in tandem with a wide range of storage options and seamless integration with Lenovo’s XClarity management system. From web serving, system management, and near-side data backup, the ST250 supports several workloads. Intel SGX provides security for blockchain applications. The ThinkSystem ST250 features a highly flexible design that deploys server performance where it's needed and adapts as requirements change over time. Expand storage configurations with up to 16x 2.5-inch hot-swappable HDDs/SSDs, and an internal M.2 module, while protecting data with various RAID options. Increase performance and connectivity with GPU support, multiple PCIe slots, and lightning-quick TruDDR4 memory. Lenovo XClarity software provides easy-to-use systems management and dramatically reduces provisioning time, while an array of XClarity integrators allow utilization of XClarity through external IT applications to streamline IT management and contain costs. The ThinkSystem ST250 is engineered for the remote office / branch office environment. A compact footprint and office-quiet cooling system satisfy on-premises use. Power supply redundancy options with dual-redundant AC power at 550W result in critical asset dependability. These components increase server uptime, workplace productivity, and asset security; the ideal solution for an environment without a dedicated on-site IT support system. To learn more about the Lenovo ThinkSystem ST250, contact your Lenovo representative or Business Partner, or visit www.lenovo.com/thinksystem. For detailed specifications, consult the ST250 product guide. Trademarks: Lenovo, the Lenovo logo, Lenovo XClarity, ThinkAgile, ThinkSystem, and TruDDR4 are trademarks or registered trademarks of Lenovo. Intel® and Xeon® are trademarks or registered trademarks of Intel Corporation or its subsidiaries in the United States and other countries. Microsoft® and Windows® are trademarks of Microsoft Corporation in the United States, other countries, or both. Other company, product, or service names may be trademarks or service marks of others. Document number DS0069, published November 5, 2018. For the latest version, go to lenovopress.com/ds0069.